The intention behind a business meeting is to establish connections and to make an impression on the fellow professionals in your industry. Thus it is very important for you to be at your best. Before deciding what to wear, it is essential to know whether there are guidelines set on a dress code for the meeting. If not, employ your greatest judgment to find out what is the level of dressing appropriately for the meeting. It is without a doubt not appropriate to show up wearing shorts, flip-flops or hoodie. It is crucial for you to dress like the professional you are or aspire to be. 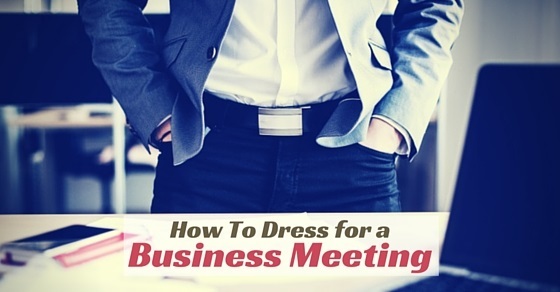 The following mentioned are few tips on choosing the best business meeting attire. Learn how to dress for success for business meetings with these tips. Employees and managers both agree that appropriate business attire makes people more lucrative. The professionals must always dress up in accordance to their professionalism. A suit is the best business meeting attire. Even though a t-shirt or jeans may be appropriate, suit has its own way to make you look highly productive. Business casuals usually is a combination of classic formals with trendy modern patterns and crop wear pieces. Business casual for women can be Capri pants or regular well fitted pants or knee length pencil skirts. On it tailored shirts and blouses would be apt. Never forget to add a blazer or even jacket which goes the same for men and women as well. Business casual attire for men can be a combination of pants, sweater and a jacket which is another version of business casual yet leaves you looking professional. Women flashing lot of skin during a meeting will be misinterpreted and it can distract people’s attention. On the other hand, men wearing shorts and t-shirts will be taken as immature, incompetent and unprofessional by others at the meeting. For women, a knit or silk blouse or a close weave sweater will be apt. These will help you for not being too revealing. Ensure that the top you pick must flatter your upper body figure. Go for solid colors and rich hue pattern on silks would be ideal. No doubt ties are pretty essential if men choose the classic formal style of apparel. It will make you look professional. However when you go for business casuals, ties are not necessary. So make sure you are teaming up all the right pieces for your final outfit. Choose a good quality tie made of high quality fabric such as silk. Go for subdued patterns or color and not any character prints. Not any piece of your apparel should be missed out and mismatch with your entire success look. When choosing a belt go for a color that matches your suit or the color of your shoes. In business casual, if you are going for the two piece suit, it is the best. However if you are buying trousers separately make sure it matches the color of your jacket. Whether you choose to wear a business casual or formal suit, the crucial thing to keep in mind is that all the pieces of the proper attire must fit you perfectly. It looks really unsuitable when your clothes are tight for you, conversely, when your clothes are loose for you, it might appear as if you have borrowed them, or were the clothes before you lost your weight and you forgot to buy new ones. Pay attention to the cuts and fit of the business formal attire and make sure it suits your body shape. When you wear a suit, the shoulders must sit square and the trouser end should be right before the shoe line. In business wear, khakis are common for both men and women. It is really ideal to stand out in a meeting. Make sure the khakis are well ironed and wrinkle free. It goes for both the sexes. Black color socks are versatile and the most common ones, however you may want to match your sock’s color with the color of your shoes or trousers so that it blends with your entire outfit. Avoid socks that are colored or have flashy patterns or even a white colored one. Sometimes it is necessary for women to opt for hosiery for skirts, or some trousers as well. You do not expose a lot of skin with the help of these and make others to pay attention to what you have to present and say other than anything else. Your clothes should be clean, fresh as well as ironed. Ensure you do not have any loose buttons or unwanted creases or even stains. Pay attention to grooming; nails must be clean and short. For women, avoid wearing extremely funky nail paints and if you choose to apply nail paint then wear a lighter shade, suiting your outfit. Avoid chipped nails. Men should polish their leather shoes. Women can wear the classic low-heeled black shoes. However for one to look and feel more confident, high-heeled shoes will be ideal. It is not necessary your shoes have to be black; you can go for the color that will compliment and match the rest of your outfit. Men must always go for leather oxford shoes. Make sure it matches the same color as the trouser or a shade darker. . Your entire professional business attire will fail if you lack the perfect hairstyle that goes well with your apparel. People in the meeting should not be distracted by your scruffy, messy hair. Men must trim the hair well and women must take care that their hair is not falling over their face, as it will just not distract you but the others in the meeting. So women can select from tying their hair into a loose ponytail or a bun. These can be easily done by using a hair band and totally reflects elegance. Make sure you are wearing a light perfume, appropriate for daytime and is not overpowering. The overpowering smell of a perfume may linger around the room for hours and disgust the people in the meeting. Women must go for natural look while doing their makeup for a meeting or work. One must wear a watch that is simple yet elegant to display success and professionalism. In case you have colorful watches, ensure that they match your casual business attire. But a timeless leather banded watch is ideal. Women should avoid wearing earrings and necklaces that are huge or flashy. A single, simple and elegant piece of jewelry on one will be enough to speak taste. Avoid being a hipster at the meeting. If the business meeting is with international clients, you need to do a little research as to what is appropriate and what is not. It implies what attire their business dress culture considers professional; it can mean covering up a little more or upgrading your overall look for decorum. Try to dress up to the same level as your seniors or your clients. For instance, if the meeting is with high level executives who wear and prefer suits, dress up in the same manner. You would not want synthetic materials as they trigger sweat, which is unacceptable at the time of a business meeting. Opt for crease free cotton material clothes which will allow your skin to breathe. You undoubtedly require a handbag as you do not want to enter a meeting room with all your personal stuff hanging out from your hand. To look organized is highly essential if you want to appear professional. Men and women must invest in a good corporate handbag which is timeless and stylish. Select a black color handbag or a color that matches your outfit for the meeting. Dressing up for a business meeting is about developing your own style statement. Since you are representing a position with specific power, you must not take risks with the business opportunities by wearing odd clothes. It doesn’t confine you to only wearing suits that are sometimes uncomfortable or shirts that you dislike. Discover your best suit for a formal attire in which you feel comfortable and self assured. Following the above mentioned business meeting attire tips, you will recognize the importance of being dressed for success. For a business meeting, go for the suitable style for you, let business clothes speak for you and leave an impression on the others of your field of you as a credible and successful expert in the field. The next time you are preparing for your meeting, take some time to prepare to look your best at the meeting as well.